Caitlin Rosenberry is an unassuming young waitress, who, due to a sudden traumatic shock suffered a stroke in her early twenties. Now almost mended, she returns to her doctor for a follow-up visit. Fortuitously, her physician is out and his replacement is the striking Dr. Chris Seacrest, neurosurgeon par excellence and chief of staff of the medical center. Their first encounter does not go well when, much to the shock of the indisputable Dr. Seacrest, she kindly refuses his medical advice. Although they both gratefully assume they’ve seen the last of each other, their paths are destined to soon cross again… and again. Coincidentally, CEO of the medical center, Danny Creighton, has previously taken a secret liking to the unusual Caitlin after repeatedly dining at the natural foods restaurant where she works. He plans to ask her out, but his best friend and associate Dr. Seacrest finds himself inexplicably drawn to Caitlin for his own reasons and uncharacteristically asks her to accompany him to a medical presentation. Caitlin begins cautiously dating the doctor but her environmentally-conscious, New Age inspired group of friends immediately mistrusts the immensely affluent, successful doctor. In addition, best friend Danny is outraged over the betrayal when he discovers Chris has been keeping his relationship with Caitlin a secret, and they quickly find themselves at odds. Although Caitlin finds herself increasingly attracted to the doctor, she begins to experience serious doubts and after a disastrous visit to his wealthy family, decides to break off the relationship. Fate has already long since intervened, however, and the breakup fatefully sets a series of cataclysmic events into motion from which there is no turning back. In the midst of it all, the emotionally inaccessible Dr. Seacrest finds himself deeply in love with Caitlin, yet she never wants to see him again. 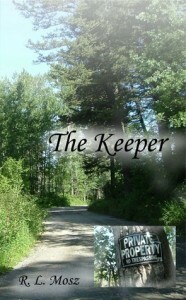 The Keeper is dedicated to victims of trauma. I was inspired to write it for them and also to make the world a better place.